Copper is excellent conductor of energy. 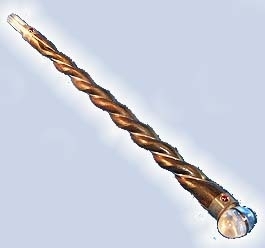 Hand-made copper wand with a small crystal sphere at one end and 6-facets point on another end. This is very powerful has the ability to conduct energy back and forth from individuals, crystals, auras, the mind and the spirit world. A beautiful hand-crafted copper wand with a small crystal ball affixed to one end and a clear crystal point in the other.